I got a whopping 24 hits on part 1 of this series, which was still about 5x as many hits as any other post I’ve made, so here’s the next part. I decided to start doing one item at a time, because I lack the attention span (on the weekend, at least) to write about 10 different tools. So for the next few posts, I’ll be talking about things that are required for most projects, but don’t count as “basic equipment”. Basically, these will be things that you’ll need to get for each project which will be specific to what you’re making, as opposed to “pantry items” like shears and a tape measure. This post focuses on the pattern itself. Wait, Yellow What? General Comments Off on Wait, Yellow What? This morning, I made homemade ketchup for the second time ever. And it turned out pretty good. The bottles (pictured to the right) are cooling on the counter right now. Once they’re done (I just heard one of them pop), they should be shelf stable, if left unopened, for at least 6 months, probably longer. This originally came about because I wanted to give my dad something unusual and hand-made for Christmas last year. He ended up getting a bottle caddy with two bottles of homemade ketchup, a bottle of homemade mustard, and a bottle of unique steak sauce that I doubt tasted any good, but sounded like fun at the time. I had lots left over (like, one of the 12-oz bottles you see in the picture, plus an entire one-quart Stor-N-Pour®, plus a bit more. I just opened the last bottle about a week ago. I really like it; it’s got an interesting twang to it, making it taste more like a steak sauce than ketchup (yes, I know ketchup can be used as steak sauce). Probably because I ran out of red wine vinegar the first time, and had to substitute some cheap balsamic vinegar instead. 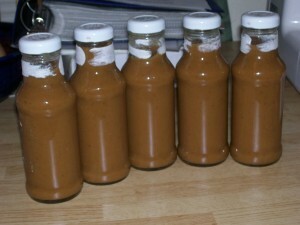 But it still turned out excellent (and I do prefer it over any other processed ketchup that I’ve ever eaten). 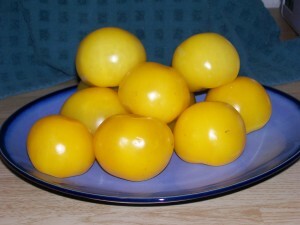 This time, I was at Central Market over the weekend, and saw that they had yellow tomatoes on sale for $1.99 a pound. I liked not having to find, buy, and chop fennel bulb. It probably made for less to strain out at the end as well. I also liked the shorter cooking time: when I cooked the last batch, I think I was in the kitchen for about 6 or 8 hours, waiting for things to reduce. This time, I started cooking at about 10:00 (after I bought and cleaned some bottles), and capped the last bottle just before 1:00. And that included a “Heather, can you stir this for me every 10 minutes or so, while I run to Chipotle for lunch?” I think that if I’d taken the tomatoes that I simply chopped, and instead made Passata out of it, I might not have had quite as long to wait for the sauce to thicken. But then I would’ve spent a couple of hours making passata, so I’ll call that one a draw. If I’d substituted white or yellow onions for the red onions in the recipe, I might’ve gotten a brighter color that was closer to yellow than brown. And if I could find a way to use a different vinegar without substantially modifying the flavor of the finished sauce, that might also add to the color. All in all, I think it turned out just fine, and now I’ve got some ketchup to keep and eat, some to give to Dad for Father’s Day next month, and some to inflict upon give to my friends. The full recipe, for those interested, is below the fold. I just watched the “pickles and preserves” episode of Jamie at Home again, because I’m planning something special for my friends and family, and it struck me as odd that the recipe cooked on the show has virtually no resemblance to the recipe that I printed off of the Food Network website – the American broadcaster for the series – a few months ago (on my birthday, it seems. Didn’t realize that). I’ve made this recipe once before, following the recipe off of the website, and it took pretty much all day. Now granted, I’d doubled it, and the recipe involves a fair amount of reduction, but I still felt that it was a lot of work for relatively little return. The recipe that I transcribed from the show, however, is not only easier, but uses several completely different ingredients, and may take up as little as half the time (by my rough estimate). I have to wonder how often this happens. Does it really do the show any justice to make the recipes easier (and, in this case, more time consuming) just to cater to your audience? In my opinion, unless there’s something substantially wrong with the recipe as presented, there’s no need to make any changes. Especially, in this case, adding a second reduction step, and trading out fennel seeds for fennel bulb (they taste similar, but are botanically COMPLETELY DIFFERENT PLANTS). That said, Central Market had yellow tomatoes on special this weekend, so I decided to buy a whole mess of ’em, and will be making some yellow ketchup tomorrow (after I go out and buy some bottles). It’ll be an interesting change from the last time I made ketchup, when I used all canned tomatoes instead of fresh, and about 1/3 balsamic vinegar because the red wine vinegar bottle wasn’t as full as I’d previously estimated. Hopefully this time I’ll end up with a product that Heather will actually eat; she didn’t really enjoy the last batch too much, because it tasted more like a steak sauce than ketchup. I’ll try to post pictures and such tomorrow, if I can remember and have had a chance to clean the kitchen well enough that I’m not ashamed of the mess. I started out this afternoon thinking “I’ve got extra POINTS(tm) to blow, I should to go to Central Market and have a pizza for lunch”. But then I realized that it was noon-thirty on a rainy Saturday, and that everyone and their dog would probably be there. So I watched some old episodes of Jamie at Home (I love his cooking style, even though I’ll never have the appreciation for bitter greens or chiles that he seems to have), to wait out either the weather or my estimate of how many people would be there. I must’ve been inspired while I was watching the cooking shows, or maybe I came to my senses and decided I didn’t need to eat all that fat and cheese. Whatever the cause, the result was the tasty recipe that’s below the fold. I was reminded, as I ate it, of a tortilla sandwich that I got as a lunchtime snack in a bar in Madrid, when I was on a tour of Southern Spain after high school. That sandwich was on a crusty baguette, and this one is on sourdough toast, but I think I properly captured the essence of the sandwich. And it was much tastier than the pizza would have been. Home cooking triumphs again! Those who follow my twitter feed probably saw something about this earlier today, but Weight Watchers seems to be working for me (again). Back in the middle of April, Heather and I stayed with my grandparents when we were up in D/FW for a wedding. I stepped on the scale after taking a shower on Saturday morning, and was greeted with a site I’d never seen before: a number over 299. Utterly disgusted with my fat self, I decided then and there that I was going to start losing weight, and not stop until I got down to what I considered reasonable (200 or lower). Knowing that this was a lofty goal, especially keeping in mind my own willpower and tendency to gain, rather than lose, weight, I’ve decided to heed standard diet advice, and set small interim goals of 2-3 pounds per week. I started doing Weight Watchers again on Monday, as soon as we got home. I failed miserably on Monday, so I decided to start again on Tuesday. I didn’t take my weight though, because I really didn’t want to get depressed again, so I simply put 300 as my starting weight for day 1, week 1. Day 1, week 2, my weight was 290. I’m not sure how much of that 10 pounds that I’d appeared to have lost was real, and how much was the difference between my grandparents’ scale and our WiiFit, but it was still 10 pounds, and the difference between “300 pounds” and “290 pounds” makes a world of difference to my brain and self-esteem. I recalculated my points according to my weight change, and continued. Now that all of the parties were over (Christina & Andy’s baby shower was at the end of Week 1), I figured I had a better chance of “being good” for a while. Day 1, week 3, and I’d only lost 1 pound; 289 is a very sad number when you were hoping for more (less?). But today it has started to pay off “for real”. Mr. WiiFit said I weighed 283.5 this morning. That’s 5.5 pounds (give or take) in the last week. It’s close to “crash diet” speed, but I’m still starting the diet so I’m not overly concerned. It’ll probably level off at 3 pounds per week after another month or so. Which (if everything goes right, and math can be trusted) puts me at 190 round about mid-December. Only I’m also not delusional, and I know that things like plateaus and holidays happen (and willpower only goes so far when there’s pie). So realistically, I’m hoping to be near my end target by November of 2010. We’ll see how that goes; it might take me 5 years or more. For now, my immediate goal is 275. (I figure 25 pounds at a time is a reasonable goal system for me). Now if I can just make myself start exercising again on a daily basis. Sedentary lifestyle + 10 years = very lazy. But I’ll have a toddler to start chasing around in a few years, so maybe all the chasing will help. I think I may turn this into a series of posts, or even an entire site. But I’ll start with one post about the basics. First, an introduction. I learned to sew in 2006, shortly after I started dating the woman who is now my lovely wife. Part of the reason I learned to sew was, to be honest, in order to find an interest that we both shared. But it’s now grown far past that; I sewed my entire outfit for Texas Renaissance Faire last year: a doublet with detachable sleeves, a high-collar, long-sleeve shirt, and a pair of fitted breeches (pants). I’ve made several shirts, a couple of doublets, and at least 2 pairs of pants. I’ve sewed several small pouches, and I’m currently working on a fairly ambitious laptop bag. I’m not brave enough to commit to making an entire outfit that I’d wear to work, for example, but in my wife’s opinion, I apparently have the skills to do. I decided to write this post (which as I said may turn into a series, or more) because I know there’s a stigma that sewing isn’t a manly thing to do, or that it’s women’s work, or that you must be gay if you like to sew and are male. So let me set the record straight (no pun intended) from the start: I am a heterosexual male, I am married and have a child on the way, and I enjoy sewing. The act of creating something with your hands, which you or someone else can then wear or use, is fascinating and deeply satisfying to me. There are many speed bumps and deep pits on the journey from “that sounds like a neat hobby” to “check out this shirt that I just finished sewing”. I’ll do my best to help you navigate around those pits, so that you too can experience the joy of creating something that isn’t made of electrons and doesn’t need to eat. I’m starting today with what I consider the “basic equipment” needed to sew. This is by no means an exhaustive list; it’s instead just the bare bones without which I would likely not start a project. Read the full list, along with some crappy pictures that I took with my phone, after the jump. I saw this “getting to know you” poll over at Brownie Points, and figured I’d answer it and pass it along. I assume this is about pans and not utensils. Non-stick for eggs, metal for things that need a good fond. Otherwise, whatever happens to be clean. cast iron, unless my arms are sore and I can’t lift it out of the cabinet. cutting board: silicon or wood? I don’t think I’ve ever seen a cutting board made out of silicon, or silicone for that matter. Polycarbonate (AKA “plastic”) for me, unless it’s exclusively for non-staining veggies. knife: carbon steel or stainless? Kitchen Aide or hand mixer? Kitchenaid, unless I’m making Chocolate Lava Muffins or too lazy to carry the mixer into the kitchen. is this a preference, or what I actually have? I love gas, but am stuck with electric at good ol’ PLV. I’ve never used an induction range. side-by-side, freezer on top, fridge on top? again, if this is preference, fridge on top. Currently, freezer on top. whoops, unless I’m deep-frying or wearing black pants; in that case, half-apron. Never full-apron. If I had a chef’s coat, I’d wear it. mashed potatoes: by hand, ricer, or mixer? My order goes “by hand”, then “ricer”, then “break out the potato flakes”. Mixer turns potatoes into glue, not food. sandwich, unless “mission style” burritos from Freebirds or Chipotle count as wraps. the rest of the ingredients that go into peanut butter cookies. Oh, you meant on a sandwich? Molasses. Or bananas and honey. Or strawberry jelly. Or “more peanut butter”. I’d forgotten about putting applesauce on pancakes until I saw this question. It was really good when I was a kid. Tends to be lite syrup these days. The cake is a lie. I mean, from scratch if I can get it, but any cake is better than no cake. Except for Red Velvet cake; “no cake” is better in that case. I’m from Texas. No beans means it’s not chili. Napkins? Hah. Paper towels (or “kitchen paper” if any Europeans are reading this). BBQ: takes the whole weekend to make or take out? As long as I get barbecue, I don’t care. I’ve never made BBQ myself though, so I guess I’ll have to go with “take out”. Depends on what it’s in. Dark meat for fajitas or in braises like my chicken pepperonata, white meat for other things (including sandwiches). ice cream: cone or dish? I waver on this one. I really like waffle cones, but can’t stand having sticky hands from the run-off, so I usually eat it from a dish (or straight from the carton).